One of the first things a lot of people do when they want to start working out and get stronger is buy a bench press like the one pictured here. It’s the most recognizable exercise. It’s easy enough to do reasonably right. But is that kind of equipment the best choice to start with? First of all, let’s be clear about what we’re looking at. A nice commercial olympic bench press you see at a gym will have firm padding, feel very sturdy, the bar holders will be widely spaced, and it may even have a spotter stand if you’re lifting heavy. A home grade bench press skimps on a lot. The padding will be just soft foam. The backrest will wobble a little. So even though it should hold up fine up to a certain amount of weight, it won’t ever feel as sturdy as a commercial bench. So if you’re going to buy one, either because you’re ignoring what I’m saying here or you have such an awesome setup already that a bench press will complement it rather than limit it, make sure you get a good model. The Ironmaster Super Bench Pro is one of the best adjustable flat/incline/decline models you can get at a reasonable price point. 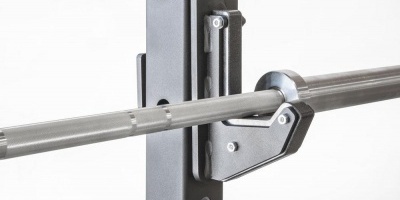 But generally the best bench presses are non-adjustable, because the fewer moving parts makes for better engineering and less chance that the backrest will wobble on what ever mechanism it uses to adjust on. 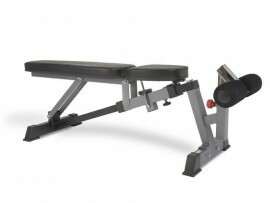 Non-adjustable bench presses come in flat, incline or decline models. Flat is of course the most common. So if you really want to duplicate the bench press you used in a commercial gym, a flat bench is the way to go. Some models have optional spotter arms that you adjust to your chest height, so that if you fail a rep the spotter arms will catch it and you can wriggle out. But most don’t have such a thing, so you’re stuck with either having a friend spot you and hope he does a good job, or just don’t lift so heavy that you will have that problem. A better solution is skipping the bench press unit and buying two items instead: an adjustable flat/incline/decline bench and a power rack. A bench press unit is mainly made for one exercise. Or if it’s adjustable to incline and decline, then you kind of get three exercises out of it. Some of them come with a few attachments on the end, like a leg curl, leg extension, and preacher curl pad, so you’ve a lot a little to work with, but the motion arc of these might not be right for your body type, and those aren’t exactly essential exercises. An adjustable flat/incline/decline (or FID for short) bench I’m talking about here does not have an attached rack like a bench press does. So one use of it is all kinds of dumbbell exercises. The other use of the FID bench is sliding it into a power rack, which is an enclosure with 4 (or more) vertical beams, connected by crossbeams. It’s a pretty simple thing, and you can do a ton with it. With the bench inside, you can do bench presses, adjusting the height of not only where you lift bar off from but also the height of the safety bars. The safety bars are the major purpose of the power rack. But that’s not all a power rack does. 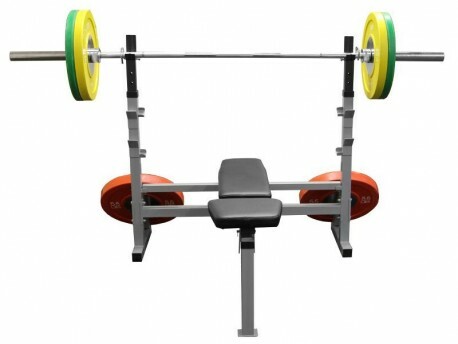 You can move the bench out and use the rack for doing squats, again very safely because of the safety bars. It has a pullup bar. Some have optional dip bars or even a lat/row attachment that you can use for lat pulldowns, rows, and several other exercises. Some of the larger power racks even have an area for weight storage on the rear. We even have a list of power rack attachments that fit other brands, so you have a ton of options. And a power rack with FID bench really doesn’t take up a larger footprint than a bench press unit. Unless you’ve got a bench press set up in your bedroom with your dresser crowding one side of the front of the bench and your nightstand crowding the other side, you can fit a power rack. The barbell really takes up most of the space either way, because it sticks out both sides and you need room to load plates on. 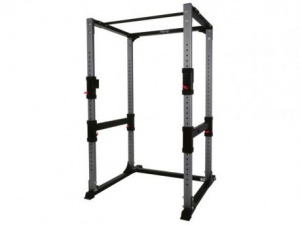 The thing is you will be spending a little more money on a power rack and FID bench. But you’ll be getting a much more versatile setup. An additional benefit you get from independent bench is the ability to do dumbbell bench presses by sliding the bench out of the rack. A dumbbell bench press is normally done with lighter weight. 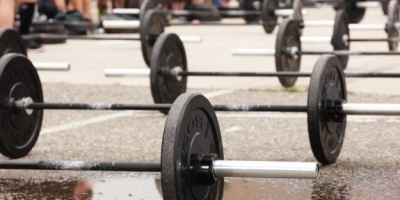 For example, if you can do 150 lbs with the barbell, you may only be able to do 60 lbs in each hand for dumbbell presses. This is because it requires you use stabilizer muscles in your chest and shoulders to balance each arm independently. The necessity to balance is why a barbell bench press is harder to do heavier weight on than a machine, and it goes double for a dumbbell bench press. Do you want to get the most out of your bench pressing routine? See Mike Robertson’s thorough article about the right way to bench!